GE has swept into the ultrasound field and set the new standard for all other companies to follow. And the LogiqBook is currently the #1 offering for affordable portable PW Doppler of the highest quality. 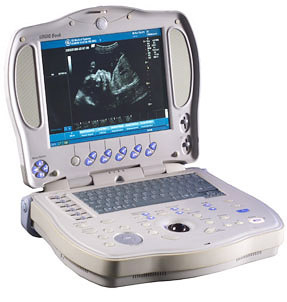 We have the wonderful good fortune of having access to exceptional refurbished, used, and demo GE ultrasound systems. Most come with a 90-day warranty (extendable to a full 12 months), and all come with free shipping. Our discounts are fantastic on the entire GE line, and particularly so in regard to the LogiqBook and LogiqBook XP. Let us know what you'll be using the system for and we can configure a GE LogiqBook for your exact needs. * Note: the LogiqBook is best suited for Vascular or OBGYN or Urological ultrasound applications . The XP has a a certain range of cardiac functionality (as well as a larger hard drive and a faster processor), but be aware that it does not have CW Doppler, which is generally required for advanced cardiology. If you are interested in a portable cardiac system, with CW Doppler, ask about the Biosound Megas ES, the Acuson Cypress, or one of the various SonoSite systems.